Claims that video game console makers are being hampered by retail have been countered by HMV, one of the UK's largest entertainment retailers. 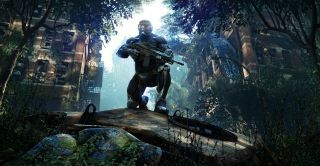 Cevat Yerli – CEO of German developer Crytek, the makers of Crysis – said to CVG earlier this week that pressure from retailers has stopped console makers from subscribing to the free-to-play business model. Speaking to TechRadar, however, HMV's head of technology and games Ewan Pinder said that the games industry should be "enabling consumer choice across all platforms" by working with retail. "Surely, it should be about the industry – whoever that may be – developers, distributors, retailers and so on, working together to respond to what people want rather than the other way round," he explained. HMV has been struggling in recent years, but, over Christmas, sales of its technology products were up 51 per cent. Boxed games and consoles are only part of its technology offering, which accounted for 12 per cent of its sales at the start of 2012. Pinder accepted that "digital will increasingly be the future", but argued that retail will remain an important part of the gaming landscape, especially when it comes to attracting mainstream consumers. "Our Oxford Street flagship store recently staged the most amazing midnight launch event for Diablo III – well over a thousand fans turned up, and if you were there you'd know what a great experience it was," he said. "It was easily bigger than anything we might typically see for music and film, and it told me two things: that gamers still really value physical content, especially where you create something special for them, and, secondly, that there is still a place for retail in the gaming landscape – whether that's in the high street, online or in the digital space." "Gamers still really value physical content, especially where you create something special for them"
Pinder's comments counter Yerli's claims that console makers are unable to put their weight behind digital-only games because of pressure from retailers. In a recent interview with CVG, Yerli said, "The number one issue that needs to be resolved is how companies like Microsoft, Sony and Nintendo become independent from retail so that they can go fully digital. "That is the biggest issue in the industry right now, because any change implies pressure from retail." Yerli said that his studio, which makes the best-selling Crysis series and earned its stripes in PC development, approached all three console makers with its forthcoming free-to-play game, Warface, but were disappointed time and again. He used Apple as an example of a manufacturer that has the ability to go "100 per cent digital" since it has control of its own distribution and retail stores. Despite his thoughts, there has been some movement in the free-to-play console arena. Sony, for one, recognises that times are changing and it has started to switch some of its own online multiplayer titles, including Killzone 3 and DC Universe Online, to the free-to-play model. Another title which has joined Sony's stable of free-to-play games is Dust 514 from Icelandic developer CCP Games. "The Sony folks have been very open and collaborative with us," said CCP CMO David Reid in a recent interview with GamesIndustry.biz. "Everybody realises that it's something different. It's a different project than other projects on the console or in the PC space really have been… this is not something we could have done on any other platform,"
Console makers and publishers don't operate in the same manner as Apple. But the rate at which digital distribution is changing the games business means that games consoles are increasingly seen as reaching a minority audience, when compared to growth in mobile and social gaming. Epic Games, a long-standing console developer and the creator of the Gears of War franchise, has found huge success in the mobile space. Co-founder Mark Rein tweeted just this week that its popular iOS game Infinity Blade has become its most profitable franchise ever "in terms of man years invested versus revenue". The franchise has earned over $30m since its first release in December 2010. And it's not just mobile gaming. The arrival HTML5 is also adding to the pressure console makers face from free-to-play games. Game developers are releasing free-to-play games which run directly within web browsers, enabling consumers to play via mobiles and tablets as well as desktops. Publisher EA is demoing a new HTML5 multiplayer game called Strike Force at Google's I/O developer conference this week. The attraction of free-to-play for consumers is the chance to sample games before committing time and money to them. And for game-makers, development is often cheaper and they have the opportunity to reach new audiences with their games.